I read this article and found it very interesting, thought it might be something for you. The article is called Hook of the Week: Starbuck’s Paper Bag and is located at https://copychief.com/hook-of-the-week-starbucks-paper-bag/. Have you noticed that once you get to know the KLT (know, like and trust) sales hook formula, you start to see it everywhere? I was in Orlando masterminding with the great Dean Jackson last week. Incredible privilege it is. The only downside is having to forego my Bulletproof coffee for subpar Starbuck’s. Don’t you feel so close to that croissant now? Wish I’da had that instead of the cookie. If you see the KLT out in the streets or on a website, I’d love to see it. Grab a screenshot or a photo and send it to me. I’ll be happy to mention you and link your site. Now i want one too. And i have never see a straight croissant. They’re the frumpy ones that can’t dance. This is a great and tasty example. And you know what I never new that only straight croissants were made with 100% butter. I’ve had them a few times and they are fantastic. And the ones filled with chocolate are even better. Damn, now I’m hungry. Oh, Taheerah… now you’ve done it. There’s a place here in downtown St. Pete that serves fresh chocolate filled croissants and I won’t rest until my next bite. I can smell them baking right now. Pure evil, I tell ya. 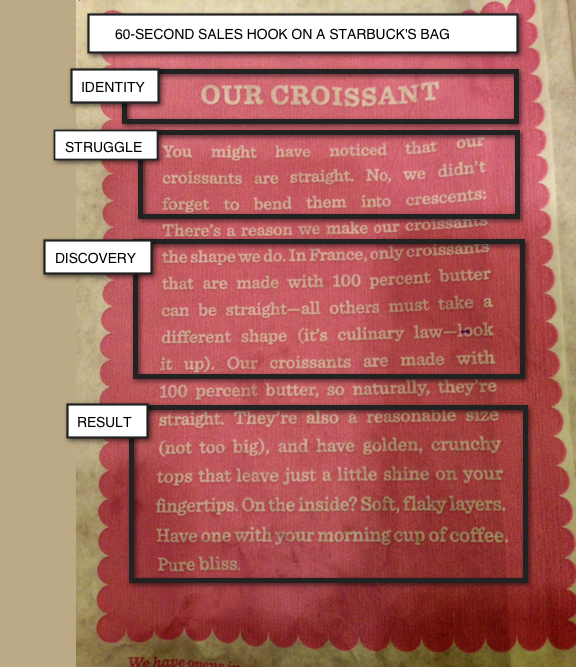 The “culinary law” of a French born croissant. Yeah I know, but man this creation was gorgeous. Minutes from the oven with a vanilla flavour. when he first met Eve. Also love the line, “leaves just a little shine on your fingertips” … gets you into the moment. LOVE LOVE LOVE the 60-Second Sales Hook!!! THANK YOU for sharing such a valuable tool with us – and especially for giving us example, after example, after example!!! Nicely done, beautifully wrapped up and promptly delivered! This one turned the lights on for me.